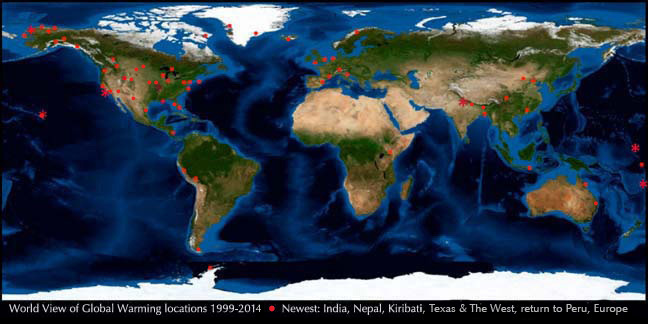 Coming of age for climate change solutions? A warming and worried world awaits action from its governments, meeting in Paris for COP21, the 21st Conference of the Parties of the UN Climate Change Convention. 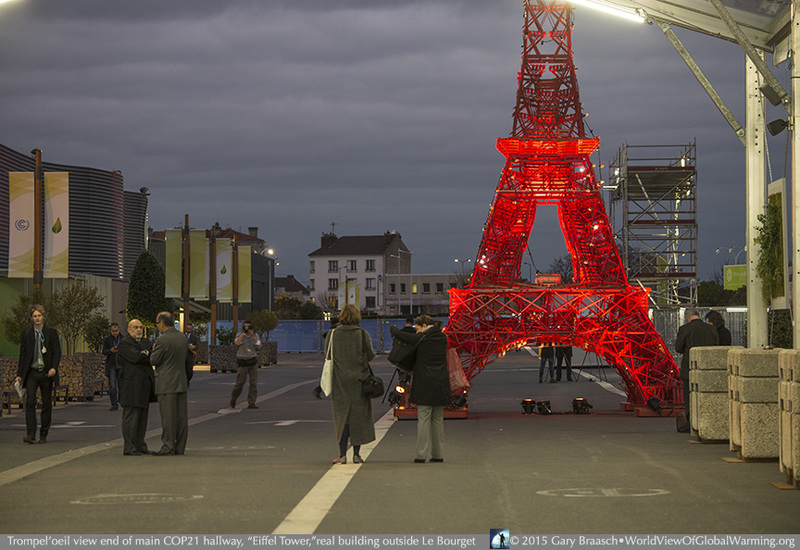 Eiffel Tower art for COP21 brilliantly displays important goals: 100% Renewable. 100% Nature. 100% Clean. 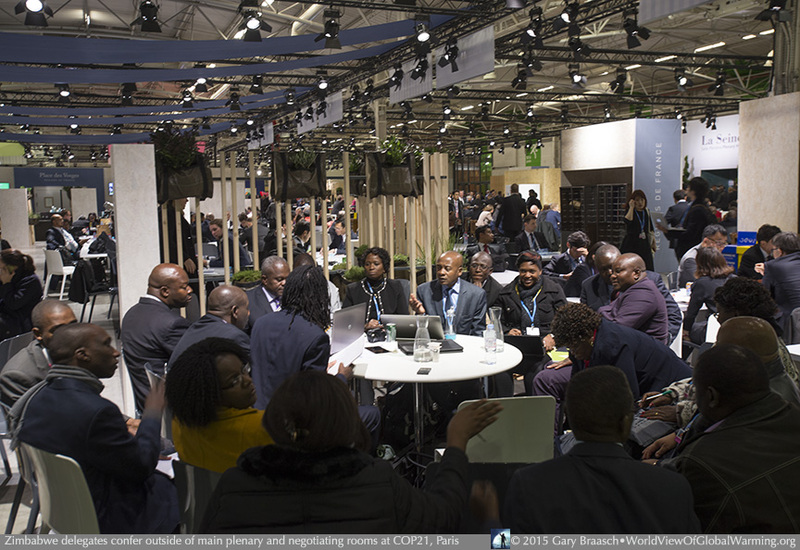 With renewed passion and much clearer purpose and motive than ever before, the 21st United Nations climate convention negotiations, COP21, began Monday in the suburbs of Paris. The key words spoken by many, both national leaders and the thousands of citizen and environmental observers in the halls, were: international, ambition, comprehensive, fairness, binding and ratchet. That is, with various levels of intent, the 191 nations in the climate convention will try over 12 days to create the first international agreement with broad enough provisions to limit global warming effects, protect the less-developed people who now suffer the brunt of disruption, with mechanisms for verification and increases in action through the century. It is clear to all that the emissions reduction pledges made by treaty nations coming into the COP will not meet the goal set in previous meetings, to keep temperature from rising another 1 degree C (1.8 degree F) above the preindustrial level; with the earth already one degree warmer from unconstrained fossil fuel burning. President Xi of China, whose nation is the leader in both carbon pollution and use of renewable technologies, did not improve on his previous commitment to just begin to lower carbon emissions by 2030. He said that any treaty should not "deny the legitimate goals of underdevoped countries to reduce poverty” and used the phrase “common but differentiated responsibility” which has in the past been a wedge between developed countries and those who are poorer but still have heavy carbon pollution, like Indonesia and India. As he spoke the air quality in Beijing thickened to the worst in months, due according to observers to both small heating fires and coal fired power plants. Delhi also had bad air pollution as Prime Minister Modi of India, whose energy plans are still heavy with coal use, said at the COP that he has 300 million people without access to energy. He said the developed nations must take the lead in cutting carbon emissions: "It is not just a question of historical responsibility," he said, "they also have the most room to make the cuts and make the strongest impact.” These statements by China and India make clear that the division between nations based on length and amount of development may make agreements difficult to achieve in the talks, but officially both nations have said they want to be part of a successful outcome in Paris. 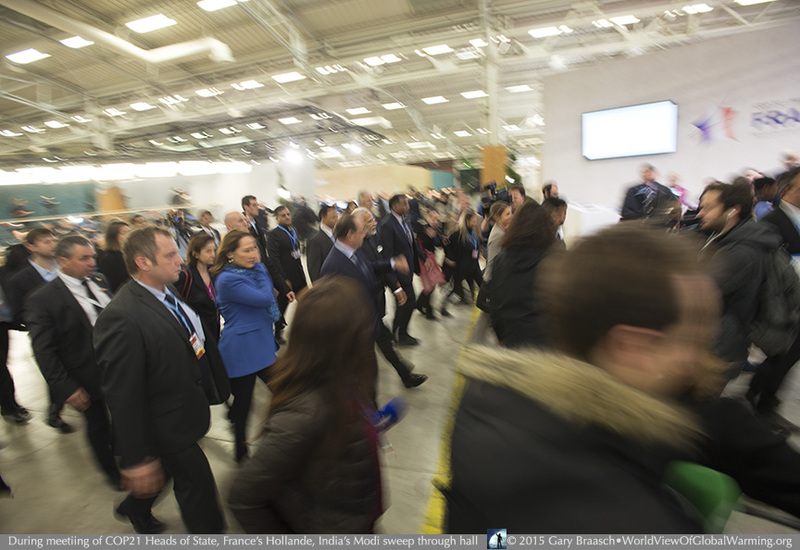 The 147 national leaders who trooped to the Paris podium for hours on Monday, however, were clearly interested in another record — the need for the first worldwide agreement to limit climate changing emissions. They were close to unanimous in the call to action, and most of them had seen damage and death to their citizens from climate change intensified storms, drought, sea level rise and flooding. There were differences, and crucially, they point toward the major stumbling blocks that must be overcome by the negotiators. Many leaders echoed Germany’s Angela Merkel in demanding an “ambitious, compreshensive, fair and binding” agreement. The two largest climate polluters, though, while in accord with the need and the danger, had different ways of speaking about the agreement. President Barack Obama did not use the word binding, for example, but was very strong in his call for "an enduring framework for human progress -- not a stopgap solution, but a long-term strategy that gives the world confidence in a low-carbon future. 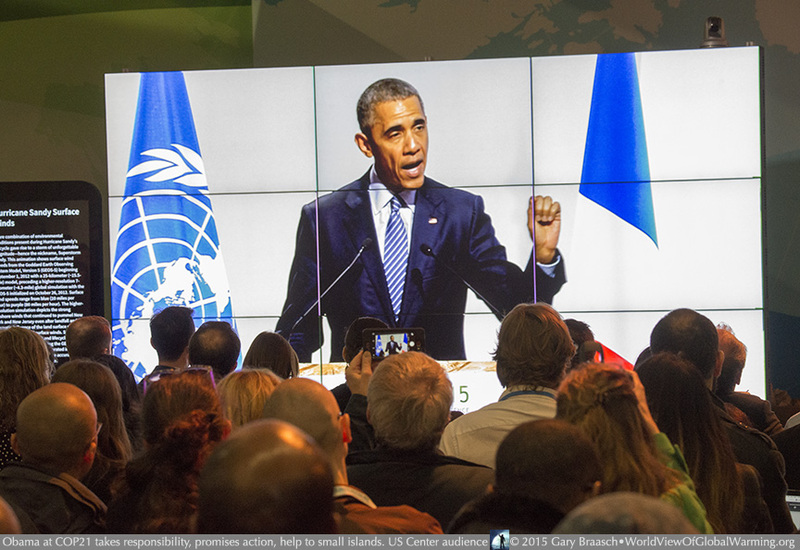 Here, in Paris,” he said, "let’s secure an agreement that builds in ambition, where progress paves the way for regularly updated targets.” He promised aid and encouraged a framework to provide it through the convention resources for "the countries that need help preparing for the impacts of climate change that we can no longer avoid. We know the truth that many nations have contributed little to climate change but will be the first to feel its most destructive effects.” The president said the U.S. took responsibility for its past emissions and said he would be meeting with leaders of the sea-level rise and storm threatened small island states on Tuesday in Paris, among other actions to deal with global warming. President Xi of China, whose nation is the leader in both carbon pollution and use of renewable technologies, did not improve on his previous commitment to just begin to lower carbon emissions by 2030. He said that any treaty should not "deny the legitimate goals of underdevoped countries to reduce poverty” and used the phrase “common but differentiated responsibility” which has in the past been a wedge between developed countries and those who are poorer but still have heavy carbon pollution, like Indonesia and India. And Prime Minister Modi of India, whose energy plans are still heavy with coal use, said he has 300 million people without access to energy. He said the developed nations must take the lead in cutting carbon emissions: "It is not just a question of historical responsibility," he said, "they also have the most room to make the cuts and make the strongest impact.” These statements make clear that the division between nations based on length and amount of development may make agreements difficult to achieve in the talks. The two-week COP21 in Paris will include hundreds of events and meetings within the security perimeter of the meeting site at Le Bourget, just north of Paris proper, and hundreds outside — although the terrible terrorist attacks in Paris on 13 November caused French authorities to cancel many large public gatherings. The night before the meeting began, throngs watched as artist Naziha Mestaoui and a team of light artists created “1heart 1tree,” splashing brilliant greens and blues on the Eiffel Tower. 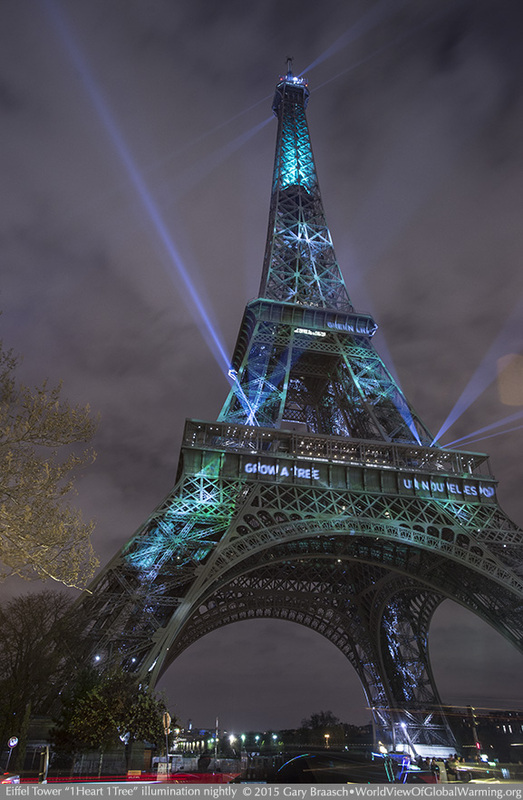 Along with the simulated plants and growing trees in the illumination, words of environmental encouragement and the goals many have demanded for the climate talks were projected on the tower. The most important of the events cancelled was a huge citizens climate march in Paris on the model of New York’s march in September 2014. Despite police demands for people not to gather, thousands brought pairs of shoes to Place de la Republique to “march” in their place. 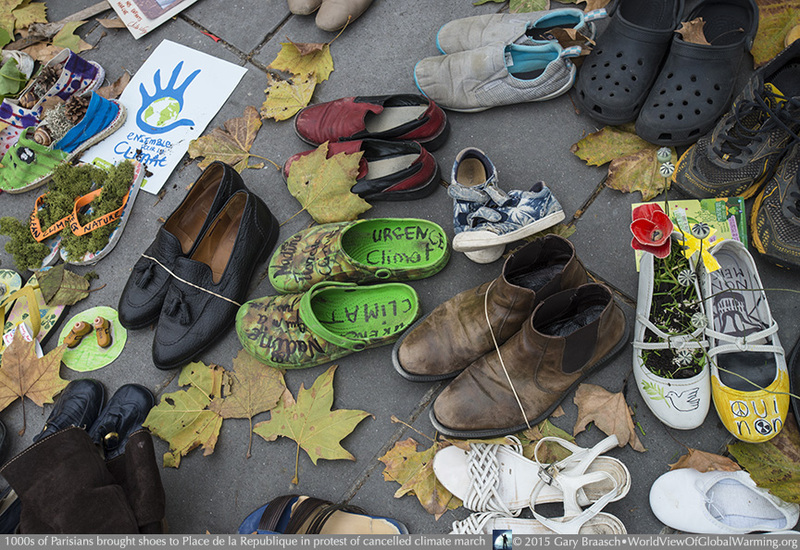 Many shoes carried environmental or climate action messages. Afterward many shoes were place among the emotion-laden flowers, candles and signs which have made the famous statue celebrating Liberty, Equality and Fraternity a powerful memorial to the dead in the November 13 terror attacks. Parisians also gathered in protest against the governments state of emergency giving authorities more arrest and investigation powers. Some protesters later fought police, who arrived in force wearing modern gladiator armor and with shields, used tear gas, arrested 200, and later cleared most of the Place. The weight of world concern and opinion was heavy as the talks convened. And there were early signs of major actions to speed the energy transition away from fossil fuels, the main cause of carbon. Along with Obama and President Hallande of France, Bill Gates announced a multi-billion dollar fund for accelerated clean energy development and deployment. The call from most environmental and citizens groups was similar to that of 350.org: “A clear demand to keep at least 80% of fossil fuels underground and finance a just transition to 100 percent renewable energy by 2050.” “Clean" to many means not just non-polluting and low in carbon emissions, but also free of the corrupting and unjust influences on governments and within corporations that have kept so many millions from having even minimal power. 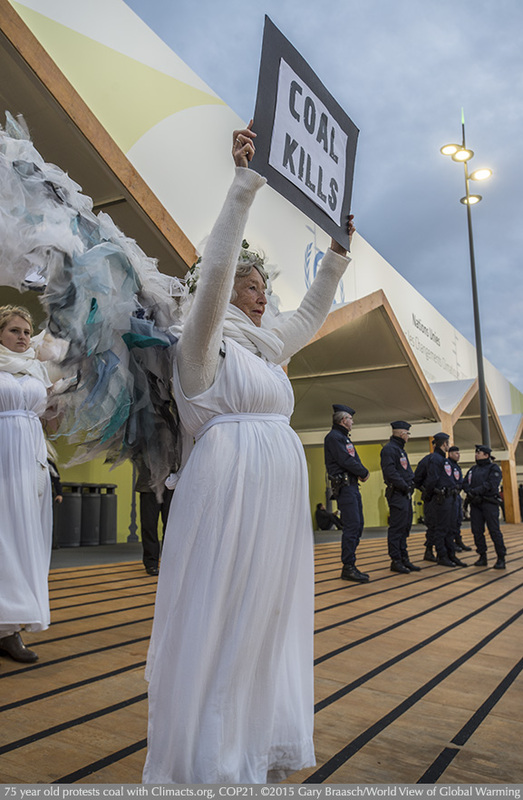 In briefings Monday in Paris leading environmental observers expressed confidence that a pact would be reached, but comments were often tinged with regret that the actions they have urged were not taken 10 or more years ago. The Kyoto Protocol of the 1990s, the first climate liming mechanism, did not include developing nations, even China, and more importantly the United States did not cooperate. In Copenhagen in 2009, the chances for a world agreement fell apart but there for the first time China, the U.S. and other leading polluters agreed that rapid global warming was a problem they all faced. Since then, science has provided more and more robust evidence that burning fossil fuels and methane producing land use has strong and long lasting effects, and the climate convention has step by step moved toward the understanding that all nations must take action. Paris’s meeting this year has been looked forward to for the last four years of preparatory negotiation. Renewable and clean energy to carry out the needs of the world for health, climate and fairness was being put forward in many studies and reports, in advance of the climate meeting.